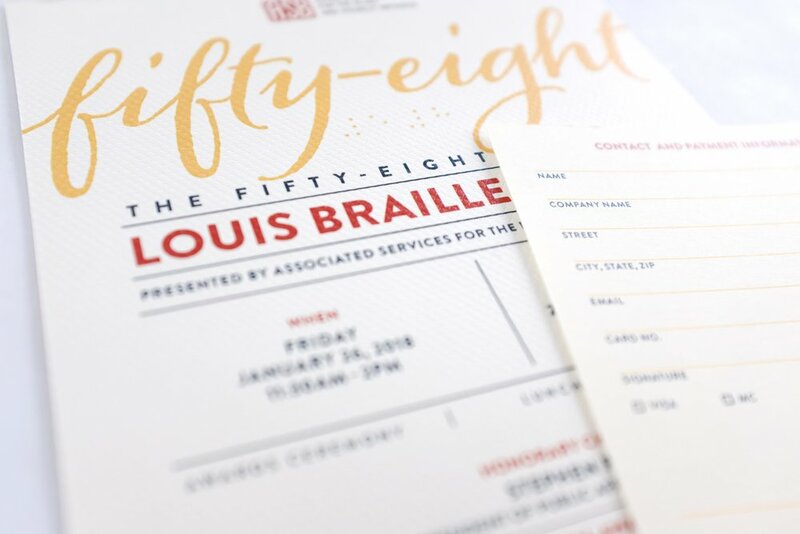 Invitation materials for the 58th Annual Louis Braille Awards featured tactile paper stock. Other event materials included presentation slides, signage, and handouts. This conference program included a Q&A card that adhered to the inside cover with a glue dot. Participants could peel off the card to submit a question to the discussion, revealing the photo beneath it. This invitation to a screening of A Watershed Moment tucks the event details behind a flap. The extraordinary nonprofit Students Run Philly Style hosts its "Extra Mile Celebration" once a year. I devised a rich two-sided design for 2016 (above) and a panoramic "z-fold" for 2015 (below).